Josiah F. Clark was born in 1858 at Missouri. He was the son of James Eden Clark and Malinda Jane Vernon. [S248] U.S. Federal Census 1860 U.S. Federal Census, by Ancestry.com, Year: 1860; Census Place: Township 61, Gentry, Missouri; Roll: M653_620; Page: 666; Image: 20; Family History Library Film: 803620. [S247] U.S. Federal Census 1870 U.S. Federal Census, by Ancestry.com, Year: 1870; Census Place: Athens, Gentry, Missouri; Roll: M593_776; Page: 531B; Image: 286; Family History Library Film: 552275. Name Variation Susan N. Clark was also known as Susie. Susan N. Clark was born in 1861 at Missouri. She was the daughter of James Eden Clark and Malinda Jane Vernon. Thomas A. Clark married Elizabeth S. (?). Thomas A. Clark was born on 17 August 1843 at Tennessee. [S249] U.S. Federal Census 1850 U.S. Federal Census, by Ancestry.com, Year: 1850; Census Place: District 45, Laclede, Missouri; Roll: M432_403; Page: 129A; Image: 262. Lettie A. Clark was born circa 1866 at Missouri. Albert G. Cregger married Ella Jane McKeehan, daughter of William White McKeehan and Anna Catherine Clark. Albert G. Cregger was born in 1871. Married Name before 1880 As of before 1880,her married name was Clark. Mary Inez Crume was born on 29 January 1862 at Gentry, Missouri. She married Harrison Vernon Clark, son of James Eden Clark and Malinda Jane Vernon, before 1880. Mary Inez Crume died on 20 November 1940 at Missouri at age 78. Elizabeth S. (?) married Thomas A. Clark, son of James Eden Clark and Malinda Jane Vernon. Name Variation Thomas Goulden was also known as Goulding. Thomas Goulden was born circa 1816 at England. He was the son of James Goulden and Mary Ellen (?). Thomas Goulden was a in 1841 at silk weaver. [S381] 1841 England Census, Class: HO107; Piece: 131; Book: 15; Civil Parish: Prestbury; County: Cheshire; Enumeration District: 15; Folio: 4; Page: 2; Line: 17; GSU roll: 241256. Name Variation William Goulden was also known as Goulding. Name Variation William Goulden was also known as Golden. William Goulden was born circa 1817 at Bramhall, Cheshire, England, also reported as circa 1821. William Goulden married Mary Ann (?) before 1843. William Goulden was a in 1841 at silk weaver. 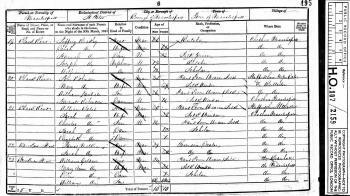 [S378] 1851 England Census, Class: HO107; Piece: 2159; Folio: 495; Page: 6; GSU roll: 87137-87138. Name Variation Hannah Goulden was also known as Goulding. Hannah Goulden was born circa 1821 at Macclesfield, Cheshire, England, also reported as circa 1826. She was the daughter of James Goulden and Mary Ellen (?). As of 1851, Hannah Goulden was never married. Hannah Goulden was a in 1841 at silk weaver. She was a in 1851 at double pisser silk. Name Variation Martha Goulden was also known as Goulding. Martha Goulden was born circa 1826 at England. Martha Goulden was a in 1841 at silk weaver. Name Variation James Goulden was also known as Goulding. James Goulden was born circa 1828 at Macclesfield, Cheshire, England. As of 1851, James Goulden was never married. James Goulden was a in 1841 at silk weaver. He was a in 1851 at hand loom weaver silk. William T. (?) was born in January 1898 at Missouri. He was the son of Catherine B. (?). [S245] U.S. Federal Census 1900 U.S. Federal Census, by Ancestry.com, Year: 1900; Census Place: Osage, Morgan, Missouri; Roll: T623_ 877; Page: 1B; Enumeration District: 78. Edna (?) was born in August 1899 at Missouri. She was the daughter of Catherine B. (?). Elmer L. Soeldner was born on 14 December 1940. He was the son of George G. Soeldner and Frieda B. Neuheisel. Elmer L. Soeldner died on 12 August 2001 at age 60. Albert W. Longfield was born circa 1885 at Cologne, Germany. He married Verna Soeldner, daughter of Joseph Soeldner and Kathryn Roth, circa 1920. Albert W. Longfield died before 1951. Albert W. Longfield immigrated in 1909. He was a hospital orderly in 1920. He was a hotel cook in 1930. He lived in 1939 at Brown, Wisconsin. He lived in 1941 at Brown, Wisconsin. He was a janitor at St. Mary's School in 1946. [S243] U.S. Federal Census 1920 U.S. Federal Census, by Ancestry.com, Year: 1920;Census Place: Green Bay Ward 1, Brown, Wisconsin; Roll: T625_1977; Page: 7B; Enumeration District: 15; Image: 461. [S250] U.S. Federal Census 1930 U.S. Federal Census, by Ancestry.com, Year: 1930; Census Place: Milwaukee, Milwaukee, Wisconsin; Roll: 2598; Page: 16B; Enumeration District: 311; Image: 210.0. Albert Joseph Blau was born on 8 February 1898 at Wisconsin. He was the son of Joseph Blau and Anna Justina Gruber. Albert Joseph Blau married Nellie P. Heiser, daughter of Jacob Heiser and Elizabeth Liegel, on 18 January 1920. Albert Joseph Blau died in September 1979 at Wisconsin at age 81. Name Variation Anton Michael Blau was also known as Tony. Anton Michael Blau was born on 24 July 1904 at Plain, Sauk, Wisconsin. Anton Michael Blau married Merie C. Moheinitzky on 30 September 1931 at Cazenovia, Wisconsin. Anton Michael Blau died on 8 September 1987 at Spring Green, Sauk, Wisconsin, at age 83 Anton Michael Blau obituary. John A. Haas was born on 22 April 1880 at Germany. He was the son of John Baptist Haas and Kunigunda Brendel. John A. Haas married Anna M. Heiser, daughter of Jacob Heiser and Elizabeth Liegel, on 7 April 1907. John A. Haas died in April 1968 at Wisconsin. John A. Haas immigrated in 1893. [S243] U.S. Federal Census 1920 U.S. Federal Census, by Ancestry.com, Year: 1920; Census Place: Franklin, Sauk, Wisconsin; Roll: T625_2015; Page: 2A; Enumeration District: 164; Image: 72. Ernest Johnson married Margaret Mary Gruber, daughter of Alois Joseph Gruber and Josephine Hartl. William Emer married Annie R. Gruber, daughter of Alois Joseph Gruber and Josephine Hartl. William Emer was born on 31 January 1896. He died on 14 December 1989 at age 93. Married Name before 1915 As of before 1915,her married name was Brechtl. Clara (?) was born on 8 November 1892 at Minnesota. She married Alois John Brechtl, son of John Baptist Brechtl and Anna Hutter, before 1915. Clara (?) died in April 1987 at Wisconsin at age 94. Robert L. Brechtl was born on 7 July 1915 at Wisconsin. He was the son of Alois John Brechtl and Clara (?). Robert L. Brechtl died on 4 July 1999 at Wisconsin at age 83. Married Name before 1923 As of before 1923,her married name was Brechtl. Grace I. Schwartz was born on 15 June 1902 at Wisconsin. She was the daughter of Thomas Schwartz. 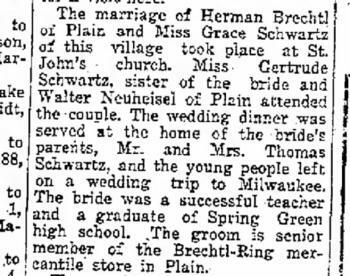 Grace I. Schwartz married Herman Fred Brechtl, son of John Baptist Brechtl and Anna Hutter, in September 1920. Grace I. Schwartz died on 3 February 1991 at Wisconsin at age 88. Anna Maria Gruber was born circa June 1873. She was the daughter of Michael Gruber and Frances Ruhland. Anna Maria Gruber died on 21 March 1874. John J. Haas was born in December 1873 at Germany. He married Franziska Gruber, daughter of Michael Gruber and Frances Ruhland, circa 1894. 1 June 1905 Franklin, Sauk, Wisconsin He appeared on the census of 1 June 1905 at Franklin, Sauk, Wisconsin. John J. Haas immigrated in 1891. He was a saloon keeper in 1900. [S245] U.S. Federal Census 1900 U.S. Federal Census, by Ancestry.com, Year: 1900; Census Place: Franklin, Sauk, Wisconsin; Roll: T623_ 1816; Page: 18B; Enumeration District: 134. [S244] U.S. Federal Census 1910 U.S. Federal Census, by Ancestry.com, Year: 1910; Census Place: Spring Green, Sauk, Wisconsin; Roll: T624_1737; Page: 1B; Enumeration District: 0126; FHL microfilm: 1375750. Anna Haas was born in May 1896 at Wisconsin. She was the daughter of John J. Haas and Franziska Gruber. 1 June 1905 Franklin, Sauk, Wisconsin Anna Haas appeared on the census of 1 June 1905 in the household of John J. Haas at Franklin, Sauk, Wisconsin. Clara Haas was born in April 1898 at Wisconsin. 1 June 1905 Franklin, Sauk, Wisconsin Clara Haas appeared on the census of 1 June 1905 in the household of John J. Haas at Franklin, Sauk, Wisconsin. Joseph Haas was born in April 1900 at Wisconsin. He was the son of John J. Haas and Franziska Gruber. 1 June 1905 Franklin, Sauk, Wisconsin Joseph Haas appeared on the census of 1 June 1905 in the household of John J. Haas at Franklin, Sauk, Wisconsin.